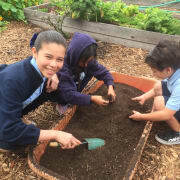 School gardens cultivate children's love of learning, healthy food, and nature through garden-based education. Unfortunately, in very high poverty communities, families are contending with issues like homelessness, hunger and other traumatic events. Thus, schools lack the financial and volunteer resources to maintain and sustain gardens. We are looking for volunteers who would like to help with any aspect of supporting a school garden for socioeconomically disadvantaged students, and I mean anything. There are lots of schools that could use help with building physical infrastructure, or gardening or creating and delivering garden-based lessons for kids. But also running errands, doing computer work, writing an interactive play about worms, etc. Flexible. We can do one-off or ongoing volunteer opportunities. If you work with students, you must submit the school district's volunteer application and get stabbed in the arm! That's a melodramatic way to say you need a TB clearance, which is good for four years.